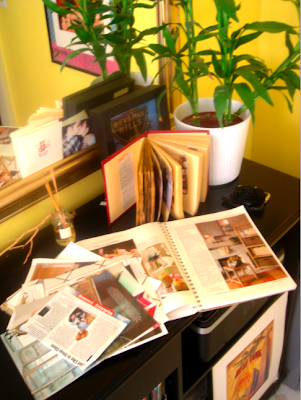 For years, I would tear out anything and everything from magazines that I loved, felt inspired by or coveted. I soon realized my box of inspirational scraps needed an organized home that I could easily access. I finally sat down one day with a sketch spiral notebook and, thus, began my Inspiration Notebooks. Now, I can simply flip through my books whenever I am looking for a design jump start. I still tear out from my mags and sit down once a month to update my current book. 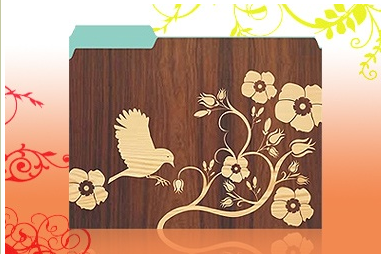 I keep the "waiting" scraps in this cute Emma Woodgrain folder (via Delight). 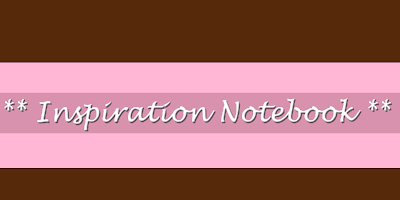 2 Responses to "DESIGN JUMP START: Inspiration Notebooks"
I've recently started doing this!! It's like all my favourite pages from my favourite magazines - all in one place!! I've done this for years -- I recently got rid of all my work and plan to start over. I have pictures of clothes, celebrities with nice hair, horses, dogs, rooms, pillows, colors, and more.